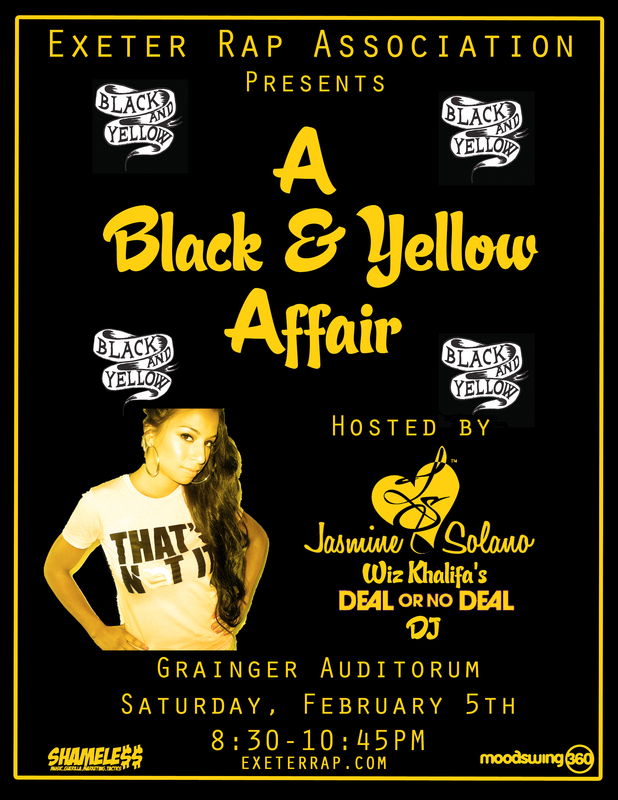 Join us on Saturday, February 6th for the Black & Yellow Affair. ERA has been synonymous with dope campus events since its inception last year and we never fail to deliver. We’ve brought you numerous concerts and we figured we’d try hosting a dance. You know we had to go hard with this one and that we did. Rather than getting your run of the mill New Hampshire DJ, we recruited Jasmine Solano, a young New York City DJ known best as Wiz Khalifa‘s official DJ during his Deal or No Deal Tour last year. To find more about her, check out her website. As for the dance, it will be in Grainger Auditorium from 8:30-10:45 PM. Please be on time…it’s not everyday you get a celebrity DJ to host a dance at Exeter. Attire is anything black and yellow. Whoever has the best Black & Yellow outfit will receive a special prize! Expect good refreshments, great music, and an amazing time. This entry was posted in Club News and tagged black and yellow, black and yellow affair, deal or no deal, era dance, jasmine solano, phillips exeter, that's not it, wiz khalifa. Bookmark the permalink.